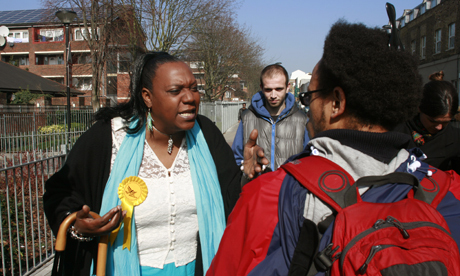 The ‘Heroine of Hackney’, Pauline Pearce, is to stand for the Liberal Democrats in the forthcoming council by-election on Thursday 3 May in Hackney Central ward. The party announced Ms Pearce’s candidacy today (Thursday 15 March) during a walkabout in Clarence Road and the Pembury Estate. She is standing on a platform of what she calls ‘unity in the community’. The 46-year-old jazz singer came to prominence last summer when she was caught on a YouTube video delivering a courageous exhortation to local youths to desist from violence during the August disturbances. Ms Pearce, also known as ‘Lady P’, is a grandmother who has lived in Hackney for seven years. She has long campaigned against gang and knife crime and started the organisation DS4L – Do Something for Life. She also hosts a chat show on the Conscious Radio community station. Earlier in her life, Ms Pearce was involved in gangs and served three years in prison for drug smuggling. “I’ve done a lot of things I’m not proud of’, she says. “Now I want to put something back into my community”. She explains her thinking: “You can’t be moaning about what’s wrong without doing something to put it right”. Ms Pearce believes that local residents need support to move away from the sorts of violence that we witnessed during last summer’s disturbances. She is adamantly opposed to the Coalition Government spending cuts and she believes policing must be reformed. “Stop-and-search needs to be addressed – not stopped but reviewed. It should be used only on reasonable grounds, and people searched should be given a receipt”. She is also against the use of water cannon and CS gas by the police as a response to rioting. One of the main planks of Ms Pearce’s election campaign will be a call for the establishment of community centres that will not be linked to individual estates and that will also serve people of all ages. When asked if her anti-cuts stance was not out of line with the actions of her chosen party, she said the Liberal Democrats are trying from inside the Coalition Government to lessen the effect of spending reductions. Simon De Deney, Chair of the Hackney Liberal Democrats, said: “We feel that Pauline will be a valuable addition to Hackney Council and we are proud to have her represent us. She is a real example of how a life can be turned around and how someone with a difficult past can give back to society”. The Hackney Central byelection is being called as Labour councillor Alan Laing is standing down for work reasons. In the 2010 local elections, Cllr Alan Laing received 2,757 votes, the largest vote of any candidate in Hackney Central Ward. Ben Hayhurst is standing as the Labour party byelection candidate. Other parties are expected to announce their candidates in due course.